London, England (CNN) -- Europeans faced fresh winter misery Friday as plunging temperatures threw transport networks -- including the Channel Tunnel train service -- into chaos and dwindling cold weather resources raised concerns in a snow-blanketed Britain and other countries. Eurostar, which operates trains between Britain and France, announced it was canceling up to 50 percent of services Friday as bad weather caused a repeat of problems that led to major disruptions and long lines of frustrated and angry travelers last month. 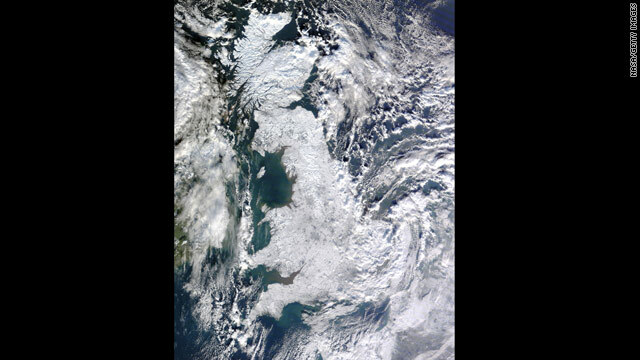 With satellite images showing the UK covered in snow from top to toe -- a rare modern event in a country that has experienced two decades of relatively mild winters -- authorities lacking snow plows and salt supplies were struggling to clear roads. Britain's weather forecasting Met Office is warning of continued icy conditions, drifting snow, severe frosts and dangerous wind chill factors across the country over the coming weekend, blaming the recent cold snap on freezing northerly blasts from the Arctic. It said icy conditions were expected to continue for the next two weeks. Forecasters were warning of similar conditions in France, Germany, Switzerland, Poland, the Czech Republic and parts of Italy in the days ahead. As temperatures plummeted to 30-year-lows of -22.3 Celsius (-8.1 Fahrenheit) in some parts of the UK, gas suppliers were reassuring users that there was no immediate likelihood that interruptions to fuel imposed on some businesses could spread to households. The National Grid, which handles supplies of natural gas across Britain, reported that is was expecting to cope with all-time record demand levels Friday after similar peaks a day earlier that called on 454 million cubic meters of gas. Despite the high demand -- and technical problems affecting gas flow from Norway -- National Grid spokeswoman Stephanie van Rosse said there was no danger of an interruption to supply. "We've got plenty coming in," she told CNN. "It's just a matter of balancing it." One of the companies whose gas was switched off was British Sugar, based in Peterborough, 130 kilometers (80 miles) north of London. A spokesman there told CNN they had simply switched to using oil until the gas comes back on. "It doesn't affect our production, so it's just business as usual," said the spokesman, who asked not to be named. "It's a bit of a non-story, really. We just switch and it's no big problem." Main airports, including Heathrow, Gatwick and Luton, were continuing to advise passengers to contact airlines before setting out as weather added to disruptions already caused by increased security in the wake of last month's failed U.S. plane bombing. Cold weather, blamed for 22 deaths countrywide, also shut schools across Britain and led to warnings of hazardous roads as grit and salt supplies wore thin, prompting local authorities to impose rationing. Environment Secretary Hilary Benn said Britain's only two suppliers of salt were operating at capacity as authorities' standard emergency provisions for six days of snowy weather ran dry. "The two salt producers are working flat-out, 24 hours-a-day, and we have ordered more salt supplies from abroad," he told the BBC. "But... we will face some difficult decisions about where we are going to prioritize gritting of roads in this exceptionally severe and prolonged cold weather."